It wasn’t a planned mission, but a good friend of mine in the hobby, Andrew, convinced me to let her fly. The Pegasus project wasn’t meant to take to the sky until sometime later next month – if not later in August. I brought the new rocket by on day #2 of the MTMA club launches for a show and tell session on the project slowly born from the leftover parts of the Artemis launch vehicle project. The idea behind Pegasus is to design a rocket with all the high speed / high altitude performance of project Aquila – only much better all around. Pegasus is much lighter & stronger than Aquila or Artemis (for its size), and is built for speeds beyond Mach 1, should I ever feel bold enough to put her up that high. The first three flights were pretty breathtaking, and it took three tries to finally catch the thing in a photograph! There is no paint on the rocket yet…in fact, the glue had *just* enough time to dry on the main airframe before we decided to send her up. All three flights were flown on a D12-5, and the altitude all three times were well in excess of 1,000 feet. As I stated earlier, the Pegasus booster was barely done. 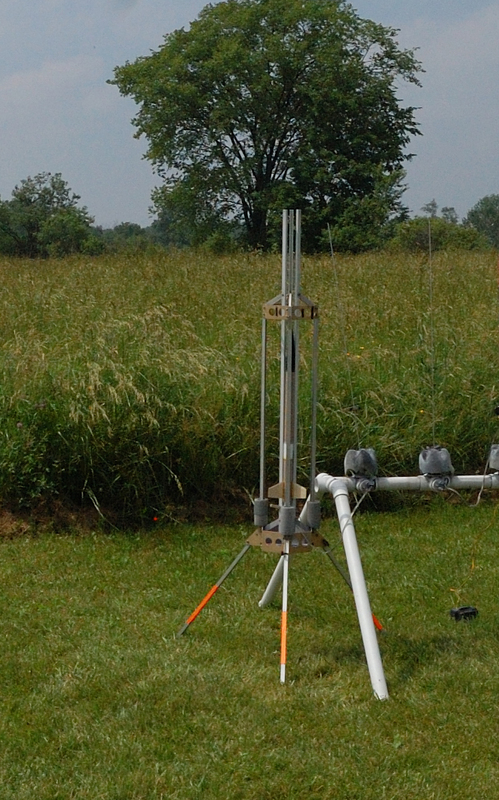 There wasn’t even a launch lug on the rocket. Good ‘ol Andrew exclaimed “Not a problem, we have a rail launcher set up!” So the rocket was launched from one of those. Pegasus booster inside the rail launcher waiting for the OK to launch. 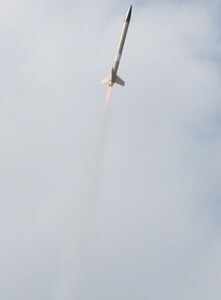 This bonus day of flights was great, and we got to see our newest rocket take to the sky!